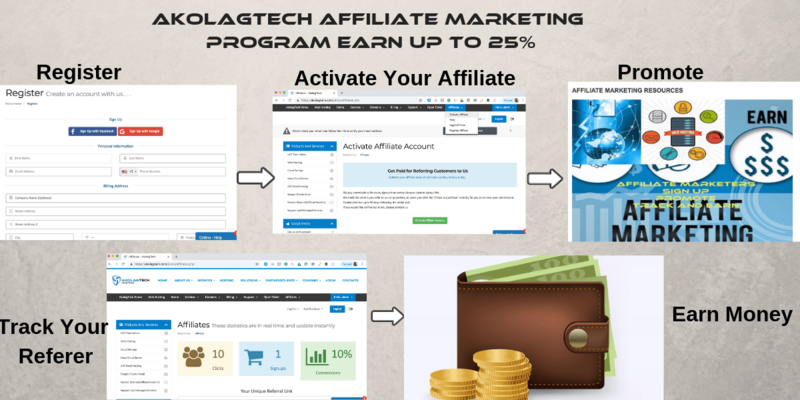 AkolagTech affiliate hosting program allows you to earn extra income when you promote our hosting plan and services to your clients, friends and other people to sign up. You will earn up to 25% in commission. We make it easy for our affiliate community to sign up, promote, track and earn money. you also have a resource to help you market the program. Best part: you will get a bonus of 1k naira if you sign up now and besides, you will earn up to 25% commission after each sale that you refer to us, is like commission based sales but its based on affiliate marketing. You will be able to request withdrawal as soon as your balance reaches the minimum required amount of ₦5,550. Anyone can join and earn money: web developers, digital marketers, bloggers, students, IT professionals and others. 1. Please read: How does AkolagTech's affiliate program work?